Whoa! That’s half a million dollars you’ll need just for medical care… but most people close to retirement don’t even have that much in total retirement savings. A stock market crash at that stage of your life can reduce your retirement lifestyle – forever. Read: How Sequence of Returns Risk Can Devastate Your Retirement Lifestyle. Solution: Take full responsibility for your own financial security. Don’t rely on the “conventional” retirement planning wisdom – what everyone just assumes is true … because everyone else assumes it’s true. And if the conventional wisdom were correct, then why would the majority of Americans have to worry about lowering their lifestyle in retirement? FACT: It isn’t necessary to risk your money to grow a sizable nest-egg. Hundreds of thousands of folks have bypassed Wall Street and achieved true financial security for life using a supercharged variation of dividend-paying whole life insurance. It’s an asset that’s grown in value every single year for more than 160 years – including during the Great Depression, Great Recession, and during every period of economic boom and bust. 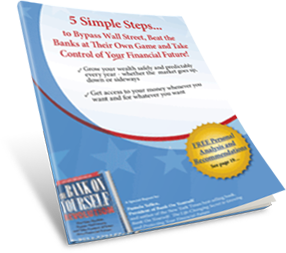 You can know your bottom-line, guaranteed numbers and results before you decide if adding the Bank On Yourself method to your financial plan is right for you. It’s amazing how motivating saving money becomes when you don’t have to worry about the next market crash wiping out your hard-earned savings again. No other financial product comes with as many advantages and guarantees as Bank On Yourself – including safety, predictability, liquidity and control, along with numerous tax advantages. Please do yourself and your family a favor and click the link above to take the first step!